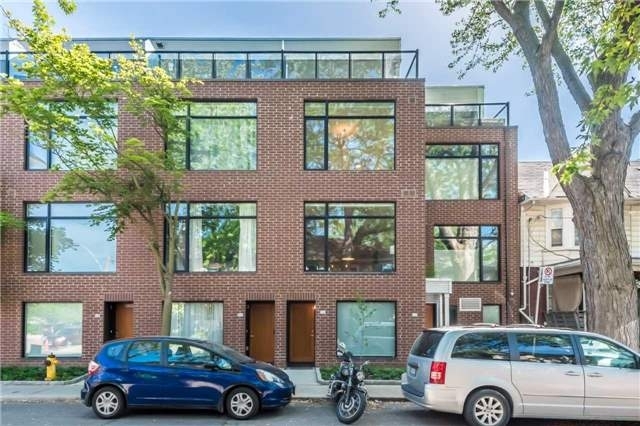 Stunning 3 Storey Townhouse On Tree-Lined Residential Street. A Block From The Boutiques And Restaurants Of Queen Street East! Three Levels Of Fabulous Living With Wall-To-Wall West Facing Windows. Sun-Filled Open Concept Kitchen/Dining/Living Floor With Light Hardwood Floors And White Kitchen Cabinetry. Master Suite With 5 Piece Ensuite, 2nd Bedroom With Double Height Ceiling, 3rd Floor Bedroom With 3 Piece Bath And Walkout To Terrace. 1 Of 4 Suites With Direct Access To Private Garage Inclusions: Fridge, Stove, Dishwasher, Microwave, Stacked Washer/Dryer, All Custom Window Blinds, Garage Door Opener, Water Tank (Rental), Excludes: Chandeliers In Dining Room, Master Bedroom, 3rd Floor Bedroom, Mirror On Master Ensuite Door, All Medeco Locks.